Education is a passion and I love to be a conduit. With a diploma in Early Childhood Education and over 10 years experience as an educator and 10 years as a successful Director of private daycares. The first and most important goal for me is to make the environment at our Garderie one that your children will trust and love to come to each and every day. Your child’s happiness, while guiding them to reach their full potential is what we believe as essential and as a result, is our mandate! At Garderie Sesame, it is our mission to ensure your child(ren) navigate balance, sharing, social skills, independence, how to express themselves and to understand their emotions. My experience in teaching elementary math and logic has given me a huge advantage in gaining insight as to what is needed to ensure your child(ren) will not only be ready for kindergarden when they graduate, but will have the social, cognitive and physical abilities to thrive as they embark on their next challenge. I cannot wait to meet your little genius! Through my extensive experience in early childhood education and development, I have identified that children learn best through play along with a rich and structured curriculum. It is for this reason that at Garderie Sesame, the weekly curriculum will be posted outside of every classroom each week. This will assure that parents will share in what their children are learning. At Garderie Sesame, each week’s curriculum is theme based. We understand that every child is unique which is why flexibility is encouraged for our educators to identify and make necessary adjustments to address each children’s interest. To ensure the success of each and every child at Garderie Sesame, your child will receive age appropriate and individualized workbooks on a page by page basis so that your child(ren) will learn at his/her own speed based on their cognitive development. I have committed my whole life to working with children and parents. Through all my years of experience in early childhood education, I am so excited to say that the approach in childhood development and the standards set forth at Garderie Sesame for our staff and programming are truly unique. I am so proud to be a part of a Garderie team that is striving to set the bar of excellence to such a high level. Our team of educators along with the dedication of ownership and management will surely act as the template of what early childhood education should and will be moving forward. 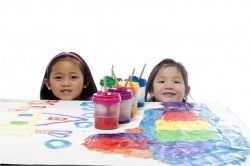 Our goal is to assure your child(ren) will enjoy a safe, warm and comfortable environment to learn and play. Safety is our number one priority. We identify each child’s strengths and use these strengths to achieve the best results. If there is a standard of excellence to be set by a garderie, then I truly believe it is Garderie Sesame.